Knotted Chord is usually a three-piece band. For major folk festivals and other special events, Knotted Chord may be a four or five-piece band. For smaller events with limited budget we can provide just two musicians. The band normally consists of Philip and Fran plus usually one or more of a pool of regular extras. 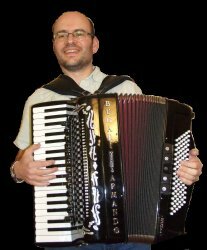 Philip leads the band and arranges all the music, playing accordion, fiddle and piano. Philip is also frequently in demand as guest artiste for several other Harrogate-based bands and he plays violin as deputy leader of Harrogate Symphony Orchestra, and cello in Harrogate Philharmonic. He also plays in the family band Stray Chords. Fran now lives in Market Deeping in Lincolnshire. 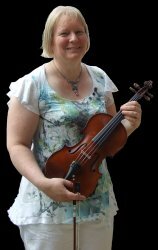 Despite the travelling involved, Fran still gets to most of the gigs and is one of the finest fiddlers on the folk dance scene today. Joshua plays fiddle, guitar, bass and concertina. He has been performing with ceilidh bands from an early age. He was the regular 3rd member of Knotted Chord for 3 years from 2015 but now lives in Sheffield and joins us occasionally. Joshua also plays in the Rowe family band Stray Chords. Benjamin currently lives in Coventry but still joins us occasonally. 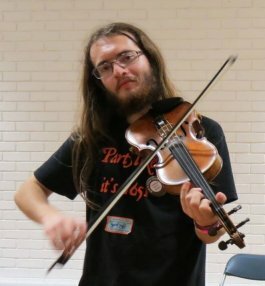 He is a hugely talented fiddler and composer who has been performing with ceilidh bands since he was 9 years old. 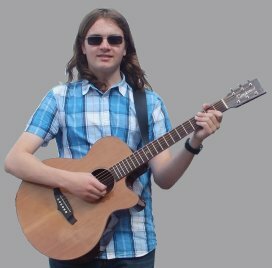 He has been a fairly frequent guest musician with Knotted Chord since 2010, and also a regular guest with several other Harrogate based bands. He joined us as a full time member in 2014 for a while (replacing Rob Ackrill). Benjamin also plays in the Rowe family band Stray Chords. He writes some of the band's material and has published a book of tunes which can be ordered at the Stray Chords online shop. Joyce Rowe is the daughter of David Bradley, accordionist and leader of the Mixolydians, and of Ann, tea chest/electric bass player and caller. Joyce was thus from an early age exposed relentlessly to the world of folk dance and music and took up the fiddle when in junior school. In the past, she has played with the Mixolydians, with several variations on family bands and occasionally with David Pattenden's former band 'O Yez', as well as a brief spell as a musician for Touchwood Appalachian, with whom she also danced for some years. (She is also a clog dancer, though very out of practice.) She was a regular member of Knotted Chord in its early years, took a break for family reasons and now joins us occasionally. Joyce also plays with Stray Chords. Whatever the number of musicians, there will always be a caller who acts as MC for the event and explains the moves of the dance. We work with a variety of callers, some of whom specialise in particular areas of folk dance, so we can always provide someone appropriate to the style of event you have in mind. We are also happy to work with any caller you may wish to choose yourself.